Keystroke Spy can be used in many computer environments, and in countless ways. Here are a few possible uses for Keystroke Spy. 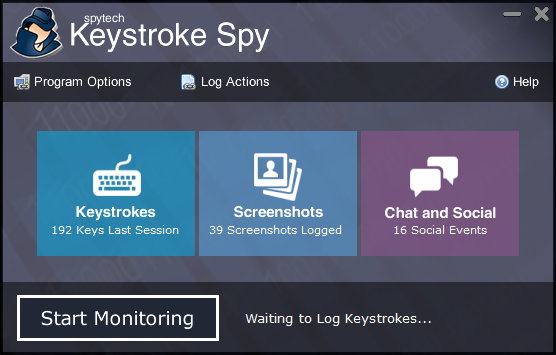 Keystroke Spy can record keystrokes typed, websites visited, and chat or email messages sent by users on your computer. Click here to read more. Keep track of what employees are doing during business hours. Are they playing games, or actually working? Click here to read more. Keep tabs on your spouse's suspicious behavior. Click here to read more. See what your children are doing on your computer, and limit their computer usage. Click here to read more. Log each and every keystroke a user types while using Windows and Mac OS. Including passwords and emails. Click here to read more. Monitor and record all internet related activities - from websites visited, to internet chat conversations. Click here to read more.